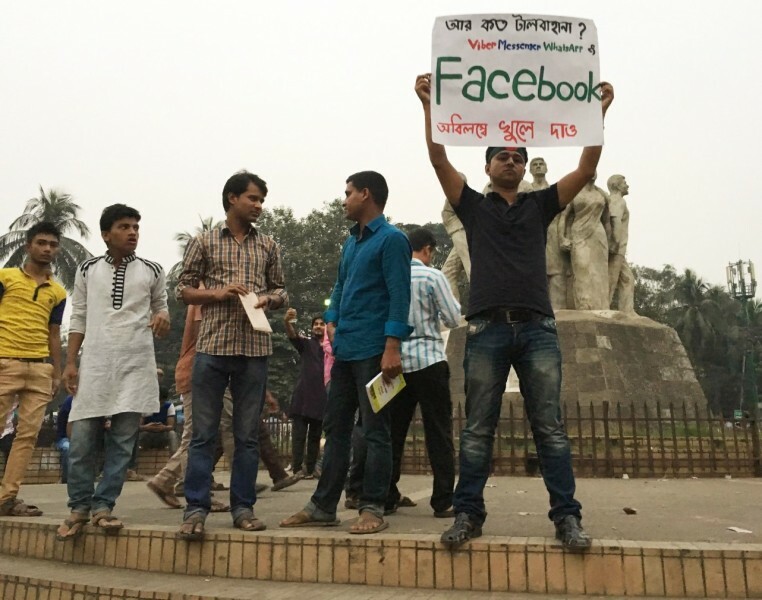 A protestor at Teacher Students Centre (TSC) of Dhaka University, during 2015 social media shutdowns. The poster reads “How many excuses more? Open Viber, Messenger, WhatsApp and Facebook NOW.” Image copyright Zaid Islam. Used with permission. Although its authors may have intended for this part of the law to be used sparingly, it is now routinely used to suppress freedom of speech and harass writers, activists, and journalists, often for their comments on social media. Bangladeshi law enables individuals and private companies to file suit against one another under the law, Section 57 of the 2013 Information and Communication Technology Act . The offenses mentioned above are non-bailable and carry a minimum punishment of seven years (with a maximum of 14 years) and a maximum fine of up to Tk 10 million (USD $123,150). On June 3, three journalists were sued by a ruling party activist in Habiganj over a report involving local ruling party (Awami League) lawmaker Abdul Majid Khan. On April 29, a private company filed a lawsuit against journalist Ahmed Razu, executive editor of online portal Natunsomay.com, for publishing two reports that allegedly tarnished the image of the company. The law has been used many times against journalists  for their comments against the rich and the powerful. Nearly 700 cases  have been filed under the ICT Act since it was amended in 2013. Research by The Daily Star shows that 60% of them were lodged under Section 57. Approximately 319 such cases are currently at trial. In the most recent publicly reported case, a professor at Dhaka University's Department of Mass Communication and Journalism used the law to sue  his colleague, Associate Professor Fahmidul Huq, over a Facebook post. The professor alleged  that the post divulged confidential official university information. Dhaka University teacher sues colleague under section 57 over a facebook post. The country I live in! As of July 17, a University spokesperson  said that Professor Abul Mansur Ahmed had decided to drop charges against his colleague, Associate Professor Fahmidul Haq. According to the statement, Ahmed took the decision after Haq uploaded another post  on Facebook apologising for his previous post. The law was first introduced in 2006. A 2013 amendment made several updates to the law, among which was an increase of the maximum punishment for certain offenses and make them non-bailable. Human rights activists and writers have long campaigned to repeal the ICT Act, reasoning that its broad scope has left it vulnerable to misuse by political opponents, enemies, and law enforcement agencies. Really, I am dumbfounded. Teachers and students of the department of mass communication and journalism of Dhaka University recently formed a human chain protesting the lawsuit under section 57 against journalist Nazmul. I don't know what you will do now. Soon a husband will sue his wife and the wife will sue her husband under the Section 57 of ICT act… Before we reach to this point, please take a stand for Fahmidul Haque. ঘরে ঘরে অনুভূতির শত্রু তৈরি করার জন্য আইসিটি ৫৭ ধারা খুবই টেকসই অস্ত্র! সরকার বুঝে শুনে একটি কালো-আইন বানিয়ে মানুষের ভেতর এই অবিশ্বাস আমদানি করছেন। এই আইন বাপ-বেটা, ভাই-ভাই, ভাই-বোন, স্বামী-স্ত্রী, আত্মীয়-অনাত্মীয়, জাতি-গোষ্ঠী-সম্প্রদায় সবার ভেতরেই কেবল অবিশ্বাস আর বিভেদ সৃষ্টি করবে। আইসিটি ৫৭ ধারা বাতিল করো! নইলে এই আইন একদিন ঘরে ঘরে শত্রু বানাবে! The section 57 of the ICT Act is an impactful tool to create enemies whose feelings are hurt somehow. The government has deliberately brought this mistrust among them using this black law. This law will create division and mistrust between father-son, siblings, couples, relatives, friends and across the society. Please repeal the section 57 of the ICT Act. Otherwise, it will create enemies among families. Many journalists have been holding rallies  demanding the controversial ICT law should be repealed. There is no control. It cannot be fathomed who is suing whom. Any statement or expression shared online can be [subject to a lawsuit] if someone else feels their feelings are hurt or they are targeted. In 2015, Barrister Barua lodged a writ petition  against this controversial act in the Supreme Court, which is still waiting for a hearing date. In May 2017, the Minister of Law, Justice and Parliamentary Affairs Anisul Huq publicly pledged to scrap Section 57 from the law. Instead, they said, these issues will be covered under Bangladesh's forthcoming Digital Security Act, which may be introduced as soon as in August 2017. It remains to be seen how this law will affect online speech, and how the many cases launched under Section 57 will play out.